Kate Moross is spending a little time in Japan this autumn, and while she is there, we thought it would be a good time to catch up on her current Japan-based adventures. 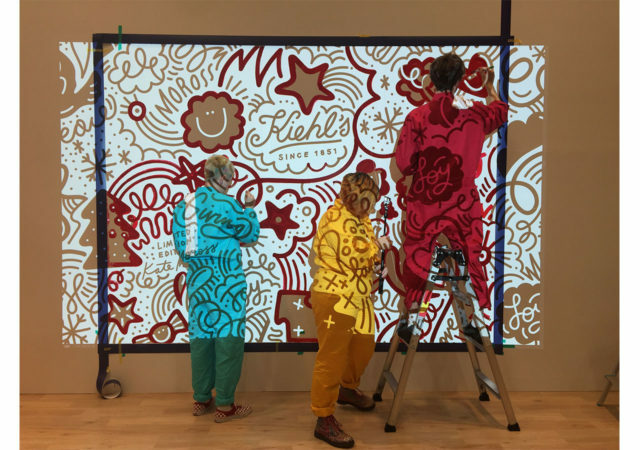 Primarily, Kate was in Japan for a special live event with Kiehl’s Since 1851, painting live in the window of Kiehl’s Tokyo store, that took place last week. As we previously discussed, she has recently collaborated with Kiehl’s on designing packaging for a set of limited edition products available in the run-up to the holiday season, and the event ties in to their launch. You can see more on this here. She also has other news related to her work for Kiehl’s. She produced a second set of packaging featuring Mickey Mouse, in a rare joint venture with Disney. And, as part of her trip, Kate planned in a visit to Tokyo Disney Resort. Kate also caught a live performance by Ai, a Japanese-American singer-songwriter, whose work crosses boundaries between Japanese pop, R ‘n’ B and hip hop. She has just released her 11th album Wa To Yo. You can see a shot from Kate’s live event at Kiehl’s below but more info and images from Kate’s time in Tokyo to follow soon. Watch this space.